Last week Marabou looked at artists installing art or themselves as acts of subversion within the museum. Today, Marabou is thinking about subtle, but impactful gestures made within the Whitney Museum’s galleries as acts of protest. Following the revelation that Whitney Vice Chairman, Warren B. Kanders, owns the military supply company that sells the tear gas used on migrants at the US/Mexico border, artists Daniel Bejar and Sibyl Kempson took to the galleries to stand against Kanders. 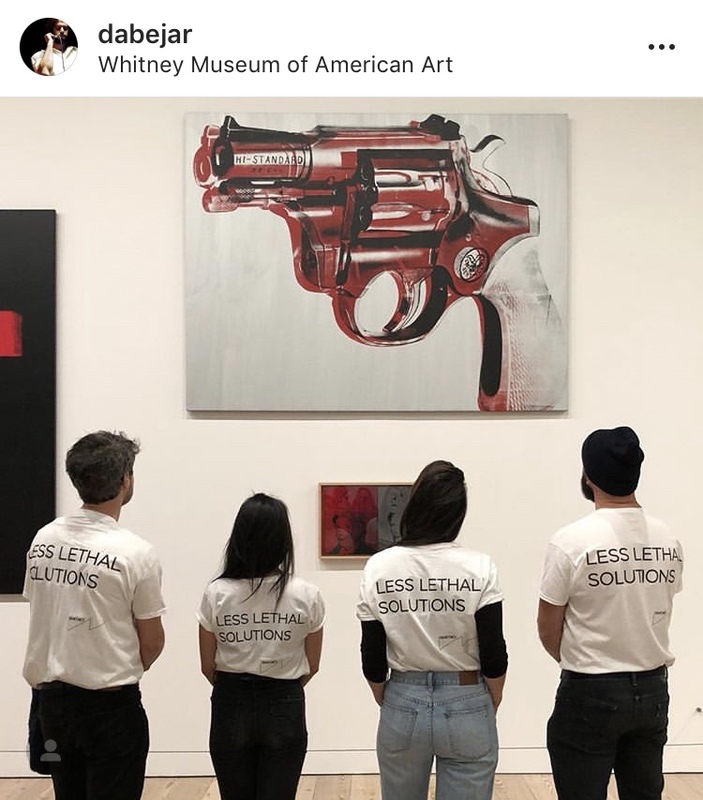 Bejar explained in a Dec 9 Instagram post, “In response to the explicit connection between these known injustices and arts funding, I organized these interventions at @whitneymuseum wearing T-shirts with @safarilandgroup subsidiary tear gas company’s slogan ‘Less Lethal Solutions’.” Bejar and others walked around the Whitney in the T-shirts, spreading awareness and piquing interest of visitors who may not know about the Kanders situation. Kempson had a three-year performance project at the Whitney called “12 Shouts to the Ten Forgotten Heavens.” Art Net reported that in the project’s last weeks she used her presence in the museum to show solidarity in the protest against Kanders and inform visitors by distributing posters created by Decolonize This Place for the Dec. 9th protest. Kempson exemplifies an artist who used her residency as more than a showcase for her art, but also as a platform to voice institutional critique. Bejar and Kempson show us that critique of the museum is possible through many different mediums and methods. Marabou encourages us to think of creative ways to express what change we want to see.